Twenty-eight sisters from Saint Bede Monastery, Eau Claire, WI transferred to Saint Benedict’s Monastery, St. Joseph, MN in August 2011. As a result, the monastery in St. Joseph, MN received an infusion of remarkable story-tellers. Sister Doris Steinfeldt is among my favorites. She has two qualities that immediately make me smile. She is fiercely independent and has never lost her capacity for sheer delight. I heard her reveal both of these qualities when she recalled how she needed to work 12 hour shifts and be on-call the other hours typically seven days a week. This was because she was working at a small hospital in Durand, WI and was the only one, day and night, who could draw blood or take x-rays for emergencies. Apparently her gift of high energy helped her continue this for years. However, in winter she would get restless, wanting to get exercise with her favorite past-time, figure skating. One day as she looked out at vacant lot across the road, she decided she would hose it down to see if she could create a rink. Her garden hose wasn’t particularly effective at this. Then she noticed in the local paper that people could write a note to Santa at Christmas time and Santa would respond. She thought, why not ask for a big hose from the fire department and see how Santa might respond. Of course, on Christmas Eve she was shocked when a fireman appeared at her door holding a giant hose. She thanked him profusely but he interrupted her. He said, “You know the men need to practice hosing each week, why don’t I arrange to have them do their practice in your empty lot.” And that’s how she got to do figure skating right across from the hospital all winter. She is now 85 years old. Only last year did she give away her treasured figure skates. On this cold and blistery day in January, we celebrated the life of Sister Lucille Hubman, whose life of service in many different places and times was remembered by those who knew her best. In Monastic Life, we have a custom of celebrating the death of a Sister. We know that she has reached her goal of seeking God and is now seeing Him face to face. We are happy for her. So, we begin our ritual by sitting with a Sister who is dying. We stay with her through all of her waking hours until she is on her way to eternity. The custom of singing songs, praying psalms, and talking about the spiritual life assures that our Dear Sister will not die alone. The Words of Remembrance are prepared by another Sister who knows the deceased Sister well and has some "stories," perhaps, to bring to the community. We love to hear about her life as a child, her family, and some of the missions where she served. Usually the stories begin to flow as soon as we have heard that our Sister has gone to Heaven. The family and friends of each Sister are invited to the Wake and Eucharistic Celebration sending her to meet God. At the funeral dinner, we tell stories and hear things about this Sister that we may not have known before. It is a wonderful time to become acquainted with the great goodness of her life. 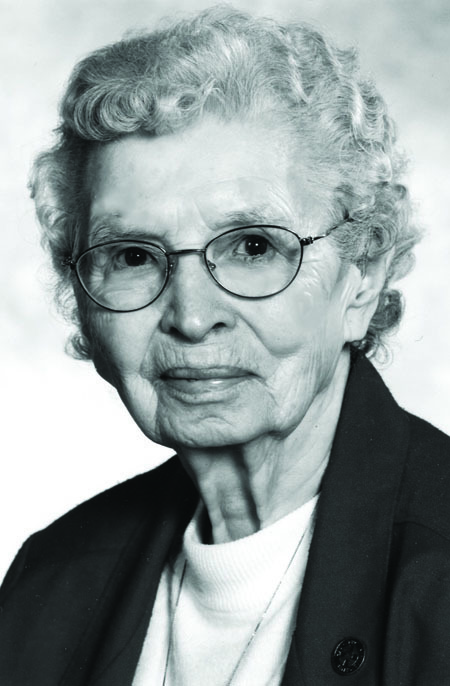 Many of us, like myself, did not know Sister Lucille well because she was part of the delegation from Eau Claire that joined St. Benedict's Monastery in 2010. But, today, I learned that she was a marvelously wise and witty woman who was loved and admired by many. I wish I had had the privilege of getting to know her. Now, I will have to wait until I meet her in Heaven. Because Benedictines have always valued sustainability, some of us volunteer at Closet 2 Closet, a nonprofit thrift shop in downtown St. Joseph whose mission is, "Reuse, Reduce, Recycle." Run entirely by volunteers and relying on donations, any profits benefit the city. The first contribution was a bicycle rack on main street purchased together with the area's Collegeville Community Credit Union. The shop offers hospitality and fosters a sense of community. Browsers and customers frequently comment on the warm welcome they receive, and on how much they enjoy the frequently added new items. I have met many new people from the local and larger area, and made friends with a German speaking elderly gentleman who checks out the book section every Saturday. Among other things, you will find: DVDs, clothing, household items, dishes, cutlery, small appliances, toys, jewelry, greeting cards, picture frames, craft supplies, vintage items, student art, and more. Closet 2 Closet is located in the former Loso grocery store and shares space with the Minnesota Food Market, an organic food coop open to everyone. Stop by to browse and chat. I have never been big on New Year’s resolutions. They have always been short lived, 24 to 48 hours at the max. Cartoon character Garfield’s resolution was not to mess with perfection. This little quip gave me a chuckle. Then I decided I am going to adopt Garfield’s resolution – not messing with perfection this year. Isn’t perfection overrated? We were created to be human not perfect. Why in the world do we continue to strive for something that doesn’t exist? Being human with all our quirks, foibles, and goofiness is perfect. All God wants this year is for you to be you. And guess what? It’s fun to human – it brings you and God joy. But if you have that personality that just needs to strive for perfection – well so be it. I guess it’s perfectly fine to strive for perfection – just don’t mess with perfection. Let life unfold with beauty, ease, color, and design and it will all be perfect. In my 74th year now, I reflect back on so many "New Years" and they begin to merge and meld into one another. No one stands out at this point and that somewhat saddens me. It reminds me that as I age I start letting many things "go" or just slip and slide away. Not least among these things are New Year resolutions.